Greater regulation of social media is "inevitable", the head of the world's biggest technology firm has told political and business leaders in Davos. 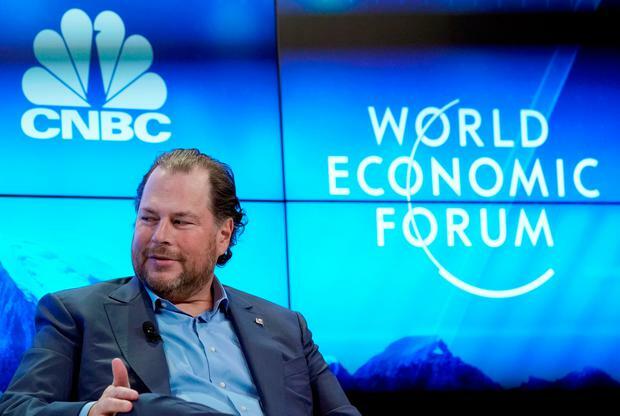 Speaking as part of a high level panel on the topic 'In Tech We Trust', the founder of cloud computing giant Salesforce, Marc Benioff, addressed delegates at the annual World Economic Forum. He compared parts of his own tech sector to the way banking had been left to run out of control before the global financial crisis and the history of cigarette making, both of which regulators eventually had to rein in. "In the tech industry, we have been completely clear of those regulations for the entire lifespan of the industry (but) we are seeing signs, especially this year, especially with the elections, especially with social networks, and especially when you see CEOs who abdicate their responsibility and say 'I didn't know'," he said. Governments had been left with no choice, he said, but to come in and say: "Hey, what's going on." The comments were seen as a view on growing criticism of sexism within tech firms and of social media businesses seen as too slow to tackle problem material shared across their platforms. Yesterday, many of the roughly 3,000 delegates had struggled to reach the Swiss ski resort due to heavy snowfall and part of the main train line had been disrupted and helicopters faced poor visibility. Some pre-summit meetings were cancelled or delayed as delegates waded through snow-blanketed streets with their luggage, trying to find their hotels. Davos panels traditionally mix business leaders with policy makers, academics and experts. While there was criticism of social media, there was also support. On a separate panel, Irish disability rights campaigner Sinéad Burke said the internet and social media had been "personally and professionally transformative" for her, allowing doors to be knocked on that never had been in the past. She had managed to get the phrase "duine beag" accepted into the Irish dictionary for people with dwarfism. The big news at this year's meeting in the Swiss resort, amid panels on the implications of the rise of automation and the plight of refugees, is the anticipated arrival of US President Donald Trump, who is due to speak. Taoiseach Leo Varadkar, Germany's Angela Merkel and British Prime Minister Theresa May are all due to attend the event, where they will mix with billionaires and CEOs and the likes of singer Elton John and actress Cate Blanchett. Both picked up awards on Monday for their work raising awareness about human rights issues.